What do you eat in Paris? 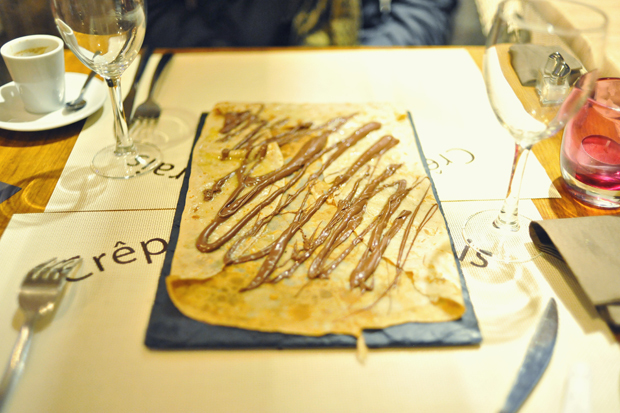 Without a doubt, we stopped for Nutella crepes more than anything else while in the city. And always because Yuriy was craving one! 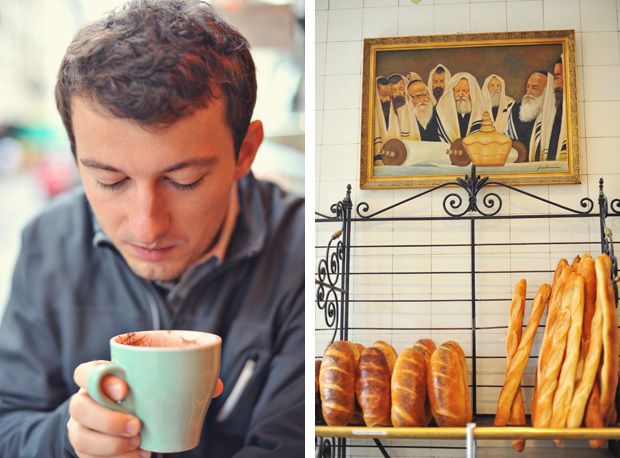 I was surprised time and time again because my husband is not a fan of desserts, but these French pastries had him hooked. Before dinner, after dinner, mid-day snack. 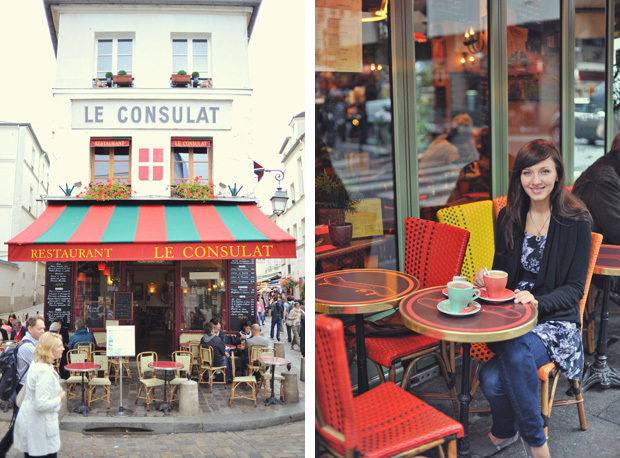 The crepe stands are on every street corner, probably more than the number of Starbucks in Seattle. The crepe is made right in front of you, and you can add Nutella, bananas, almonds, coconut, or jam inside. We decided plain Nutella was best. Classics win. A crepe can become a meal with meat, cheese, eggs, and veggies inside. These are called galettes. We didn’t find any on the streets; you had to sit down for one. We had them for dinner at a small place called Creperie du Marias on our second night in Paris. The galette is about the thickness of a tortilla but much bigger. Though the dough is thin, it’s soft, and hopefully crispy around the edges. Toppings were piled on top and served open at the table. We had to fold the galette ourselves. Our favorite meal was at a nearby restaurant called Pasta Ricca. Yuriy and I ate out on the covered patio on a busy Saturday evening when everyone seemed to be outdoors on the streets. I ordered a decent sized pizza with potatoes, bacon, caramelized onions, and cheese, and don't remember what it was called on the menu (darn). So few toppings, but so much flavor! Yuriy ordered pasta, which was equally satisfying, as it should be from an Italian restaurant. The table had a bottle of the best olive oil we’ve tried, bottled with peppers and other spices. The bread and oil alone were very tasty. Unfortunately, it was one of the only nights we didn’t bring a camera! Later today: more on food (yum!) and Paris dining etiquette. That picture with all the meat and potatoes. Were you two supposed to eat all that? It really looks just like good home cooking. Its so awesome how you guys are documenting everything and I love the photos! Makes me feel like I'm there, and makes me want to have nutella! *wink* God Bless you guys on this trip and your marriage. WOW. my mouth is watering from all these beautiful photos of food. i just read the last 4 posts all in a row and said to my husband "wow, that was fun!" you guys are amazing photographers, i feel like i'm right there with you traveling the streets of Paris. i just can't get over how beautiful it is there! and again, you guys do a fantastic job of portraying it. thanks again for sharing! can't wait for more! Mmm...all that food and sweets look DELISH! nutella crepes are the best! Especially in paris!!! That little pizza looks soooo yummy... it's got my tummy growling now!! Oh and those sandwiches in the window remind me of the food in Milan - lots of little shops with sandwiches like that, just bread and meat and cheese. 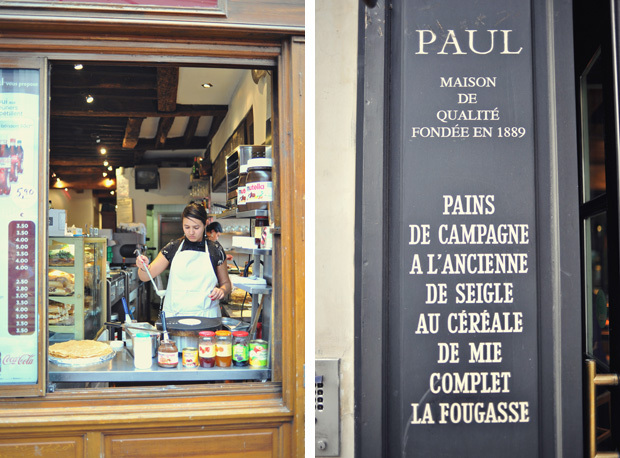 Paul is one of the places I miss most about Paris...these photos are stunning!